This company performs before each performance of Calamity Jane and Man of La Mancha. Rehearsals for Calamity Jane pre show begin Saturday, June 8, 2019. The commitment for this company lasts through November 10, 2019. The Junior Company is Good Company Players’ respected troupe of young performers, aged 8-16, who present a 15-minute ‘Pre-Show’ before most main-stage performances at Roger Rocka’s Dinner Theater. The Junior Company usually rehearses on Saturdays from 9:00 am to 3:00 pm and performs Thursdays through Sundays. There are some variations in rehearsal times — on opening week, for example, the Junior Company rehearses Monday, Tuesday and Wednesday. Want to be in a GCP show? 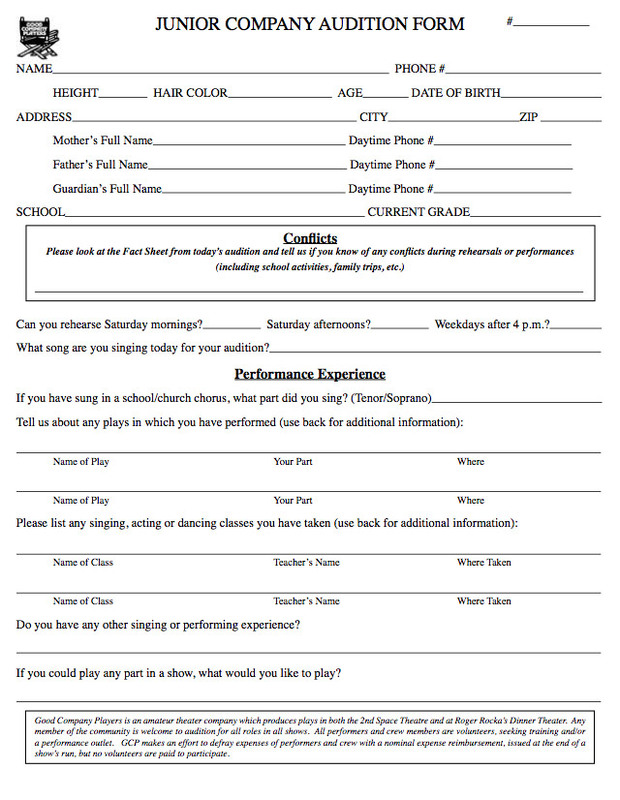 Read the show details, fill out this form, print it out and bring to auditions with you. If you aren’t able to print, or forget your form, there will be forms to fill out at the audition, as well.